At Betenbaugh Financial, we believe prudent financial planning is essential for sustainable financial success. 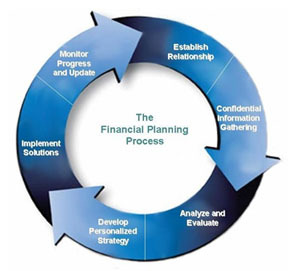 The following is our core process for establishing and maintaining a sound financial plan for you. Get to know you and your circumstances - Our work as financial advisors is all about you! The first step in the financial planning process must be to understand and indentify what is important to you and what financial experiences have helped shape your current financial circumstances. One size does not fit all with investments and financial planning and we will work with you to create a plan specific to your unique needs, wants and circumstances. Develop a financial plan - Depending on you and your needs, developing a prudent financial plan may involve a comprehensive and formal financial plan or simply a well crafted plan of action specifically designed to address one or more of your specific financial objectives. Regardless of size and scope, your plan of action needs to be practical and offer financial solutions properly aligned with your goals, needs, comfort level, and circumstances. Review and implement your plan - It is imperative that you fully understand the plan or recommendations we produce and that you are comfortable with the plan of action moving forward. We will spend as much time as you deem necessary to review and discuss our recommendations with you. The next step after you are comfortable with the proposed plan of action is take action and implement the plan. Monitor your plan, progress, and circumstances - This step is just as important as the first three. We must stay in contact and ensure the financial plan we have put in place is up to date and consistent with your current circumstances. Items traditionally covered during financial reviews include answering any of your general questions, discussing current market and economic conditions, discussing the progress of your financial goals and planning initiatives, exploring any tax planning or investment strategies for the year, reviewing changes to your circumstances or investment objectives, and reviewing your portfolios recent performance.